Low-Power Wide-Area Networks (LPWAN or LPWA networks) are a new disruptive connectivity technology. In recent years, LPWAN technologies have emerged as an upcoming viable alternative that is set to replace traditional wireless technologies such as 2G or 3G for many Internet of Things implementations. LPWAN technologies provide low-cost power-efficient communication – just what is needed for many IoT use cases. Cellular Mobile Network Operators (MNOs) such as AT&T, Vodafone or China Telecom have realized both the potential as well as the threat that this technology poses – their LPWAN strategies, however, vary – as this analysis shows. As part of our effort to track the IoT connectivity landscape, IoT Analytics recently published a 260-page market study which investigated the current status and future outlook of the LPWAN market and LPWAN technologies. 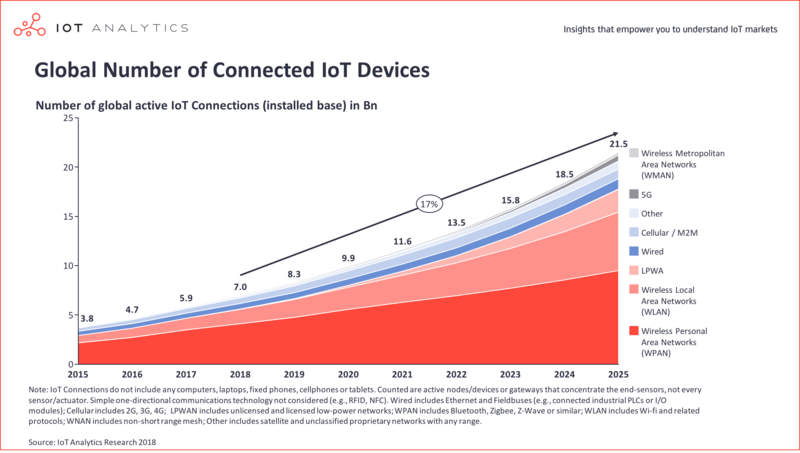 IoT Analytics predicts that LPWANs will be the fastest growing IoT connectivity technology in the next 5 years. The number of LPWAN connections is forecasted to grow 109% per year and should exceed the 1B mark in 2023. Currently, the market is still at an early phase and characterized by a high degree of technological fragmentation. IoT Analytics investigated 16 LPWAN technologies and found that their network footprint is mostly far from being global. However, the market estimates show the market is quickly consolidating around a few of these LPWAN technologies, specifically Sigfox and LoRa in the unlicensed portion of the radio spectrum, and NB-IoT and LTE-M in the licensed spectrum. The amount and speed of public network roll-outs that involves these 4 technologies has been unprecedented over the last couple of years, both by incumbent telecom operators and by smaller network providers. In order to achieve widespread, global coverage for each of these technologies, a good set of local mobile network operators (MNOs) is required. MNOs are providers of wireless communication services that own or control the complete telecom infrastructure necessary to sell and deliver services to their subscribed mobile users. Note that in this article, we make a distinction between cellular MNOs, i.e. companies that already operate a cellular network (2G, 3G or 4G), and non-cellular MNOs. By the time this article was written (October 2018), IoT Analytics counted 199 public LPWA networks that were commercially deployed and that operate on one of these 4 technologies. Each of these networks have been deployed by a different MNO either on a national, regional or city-wide scale, but there may actually be more networks than we are not aware of. If you are reading this in a major city, chances are that a LoRaWAN, Sigfox, NB-IoT, or LTE-M network is available at your current location right now. #1: LoRaWAN (83 operators globally). According to the LoRa Alliance, by October 2018 there were 83 operators that have rolled-out a public LoRaWAN network, providing coverage in 49 countries. If we also count the open-source community of the Things Network and a few other entities that have deployed private LoRaWAN networks, the number of countries with LoRaWAN deployments grows to 95. The majority of these LoRaWAN public networks are built and managed by small non-cellular operators and have a limited geographical footprint (often on a city-wide or regional scale). Some of these operators are new companies that were formed specifically to be a LoRaWAN operator, but there are also many players coming from other IoT or telecom related businesses, such as wired broadband internet and telephony providers, radio and television broadcasters, as well as providers of various other telecommunication services and IoT end-to-end solutions. Lora operator examples include ZTE, Tata Communications, Orange, and KPN. 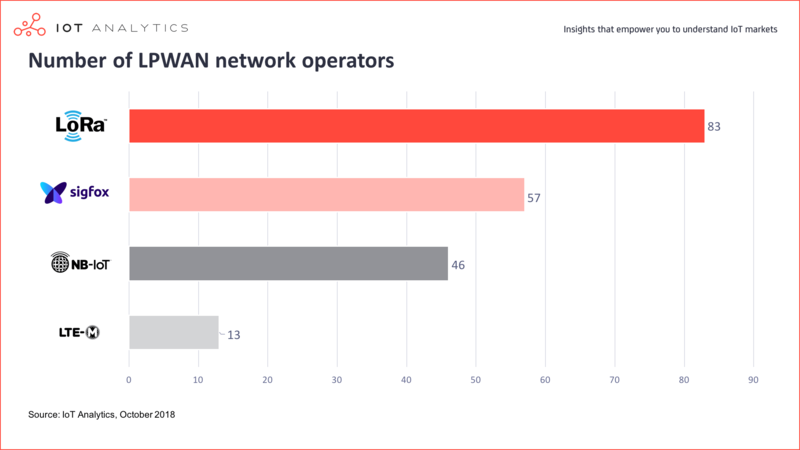 Overall, the range of LoRaWAN operators is the most heterogenous when compared to other LPWAN technologies. #2 Sigfox (57 operators globally). According to Sigfox, by October 2018 their LPWAN network was present in 57 different countries worldwide. In December 2017, the company claimed to have coverage in over 45 countries, while in November 2016 Sigfox was present in 26 countries. Thus, the number of countries with Sigfox coverage has more than doubled over the past two years. A look at the Sigfox coverage map shows that nation-wide coverage is provided only in Western European countries, while in the rest of the world the network coverage is rather spotty and limited to a few major cities and high-traffic areas. In terms of network operators, Sigfox provides exclusive rights to deploy its network to one operator per country. None of the Sigfox operators are cellular MNOs, and many of them are actually new actors in this space. Notable examples include Sigfox itself, that acts as a network operator in a few countries, such as France, Spain, Germany and USA, and WND, that has national subsidiaries in UK and in several countries in Latin America, all acting as independent Sigfox operators. #3 NB-IoT (46 operators globally). According to GSMA, by September 2018 there were 46 commercially launched NB-IoT networks over 28 different countries (17 in Europe, 8 in APAC, 3 in Middle East and Africa). The operators deploying these networks are all cellular MNOs with an LTE network already in place such as Vodafone, T-Mobile, Orange, Telefonica, and the three major Chinese operators (China Mobile, China Telecom, China Unicom). For them, rolling-out a NB-IoT network is quite straightforward, as they can re-use their existing LTE infrastructure, and in many cases, they are only required to firmware upgrade their LTE base stations to enable NB-IoT support. Note that in our count, we considered national MNOs, i.e. one MNO for each nation-wide network. For example, Vodafone as a global company has deployed 9 NB-IoT networks over 9 countries, but in this blog post it was counted as 9 different MNOs since it has a national subsidiary in each country. #4 LTE-M (13 operators globally). According to GSMA, by September 2018 there were 13 commercially launched LTE-M networks in 12 countries (6 in Asia Pacific, 2 in Europe, 1 in North America, 1 in Latin America, 2 in Middle East and Africa). As for NB-IoT, these are all cellular MNOS such as AT&T, Verizon, KPN and Orange, that in many cases only need to upgrade their LTE base stations to provide LTE-M coverage. Also, here we considered in the count one different MNO for each nation-wide network even if these are national subsidiaries of the same global MNO. For example, AT&T has deployed two nation-wide LTE-M networks in USA and Mexico respectively, and it was counted twice since these are national subsidiaries of the same company. Out of the over 750 cellular MNOs currently operating worldwide (according to GSMA), only 52 have deployed commercial LPWAN networks up to date, which is less than 7%. If we look at how these MNOs are reacting to the emergence of LPWAN technologies, we can distinguish 4 different strategies. We have heard that some operators (particularly small ones) don’t believe LPWAN is particularly relevant for their business and are thus not planning to adopt any of these technologies, at least in the near future. Others, especially in the less developed countries, either have no LTE infrastructure in place or this has a poor coverage, while they are still seeing a lot of traction for their GSM networks. For them, investing in LPWAN would be too expensive when compared to the expected additional revenues from LPWAN connectivity, and they will likely wait for a consolidation in the 5G standard before making additional investments in their infrastructure. Among the cellular operators that have jumped on the LPWAN bandwagon, the majority are betting on only one licensed technology (either NB-IoT or LTE-M), specifically the one they believe is stronger and would have the highest market traction within their local markets. Currently we count 42 national MNOs who have already launched a commercial LPWAN based on only one licensed technology, but some more are currently rolling-out an LPWAN or have announced plans to do so in the near future. 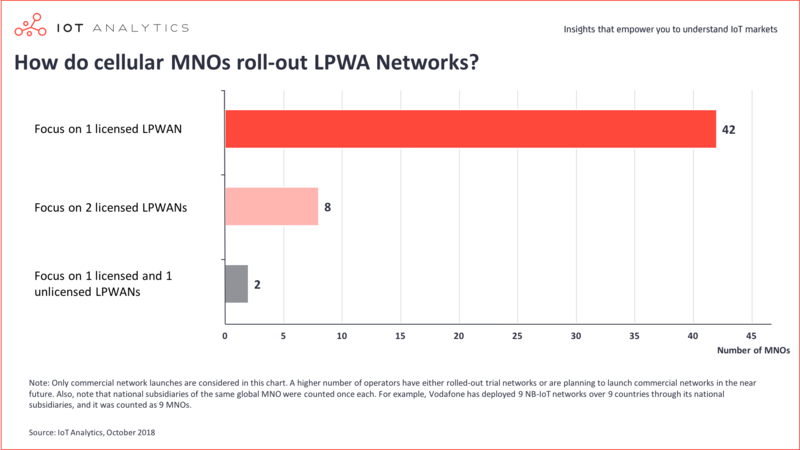 While still a minority, a small number of cellular MNOs have either deployed or shown interest in both licensed and unlicensed LPWANs, specifically LoRaWAN. Both have nation-wide LTE-M and LoRaWAN networks. French MNO, Orange, has deployed NB-IoT and LTE-M networks in Belgium, while in France it has a LoRaWAN network. Other cellular operators, including Swisscom, Proximus, SoftBank and Bouygues Telecom (through its subsidiary Objenious) have joined the LoRa Alliance and have already deployed a LoRaWAN network. While they made no announcements regarding licensed technologies, it is safe to assume that they may complement their LoRaWAN offering with either NB-IoT or LTE-M in the future, if not both. We see a trend towards strategies 3 and 4, i.e. cellular MNOs betting on more than one LPWAN technology. This is motivated both by technical and by strategic reasons. Technical rationale: Combining multiple technologies allows the operator to address a larger spectrum of IoT use cases and requirements, given the complementarity of the different technologies. While the complementarity of LTE-M and NB-IoT is well known, with the former more suited for higher-end applications with higher data transmission needs, a few LoRa suppliers have recently highlighted how LoRaWAN can be used in conjunction with licensed technologies. A possible model of collaboration between LoRaWAN and licensed technologies would be to use LoRaWAN to improve the coverage in areas at the edge of the licensed networks or to provide areas previously uncovered at a low cost, thus expanding the coverage beyond the LTE infrastructure. Strategic rationale: Betting on more than one technology typically requires a small additional cost for the network infrastructure – in the case of LTE-M and NB-IoT, upgrading to both at the same time should cost only 20% more than upgrading to just one – but it allows an operator to differentiate its investment and reduce the risks. While some technologies like LoRa and NB-IoT are gaining more and more acceptance and are likely here to stay, most LPWAN technologies still have an uncertain future and may not experience the device volumes that were initially anticipated. What happened in USA with LTE-M is just one example. There, AT&T and Verizon had initially bet on LTE-M only to address the demand for IoT connectivity, and network roll-outs were completed in 2017, but following the low market traction of the technology and the high customer demand for NB-IoT, both operators have recently announced their plans to deploy nation-wide NB-IoT networks within 2019. This trend should not come as a surprise to industry experts. For a few years, some of them had already highlighted how no single LPWAN technology that can cover all use cases. In the end, we believe that a multi-technological strategy will be key for the success of this market, and it seems that operators have come to the same conclusion and are getting ready to do that. If you want to understand more about LPWAN operator strategies (e.g., a list of which major operator is associated with which LPWAN technology) or the LPWAN market in general (e.g., How do the different LPWAN technologies compare to each other in terms of technical features, business model, ecosystem? What are the key use cases targeted by LPWAN and how well different LPWANs address their requirements? Which LPWAN technologies are leading the market growth, and what are their market shares? 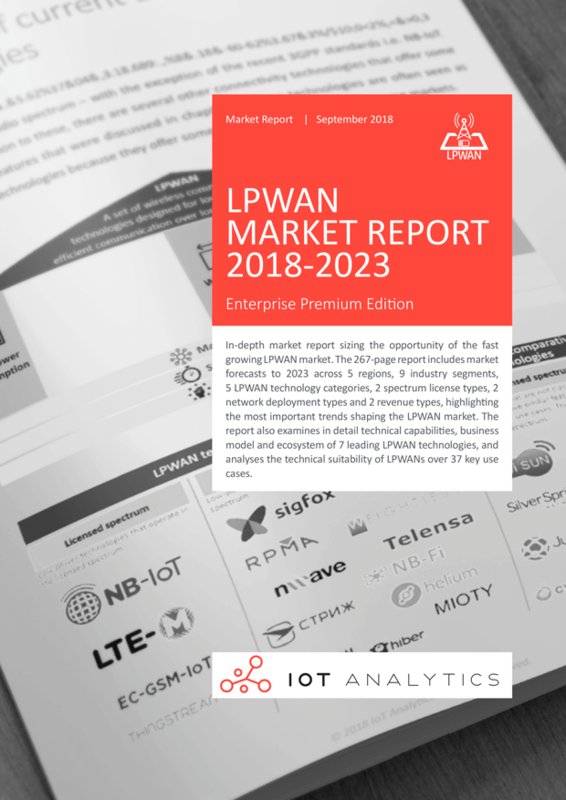 And much more) check out the LPWAN Market Report 2018-2023. This report, published in September 2018, offers many further in-depth insights on the LPWAN market (260 pages). The post LPWAN technologies: How cellular MNOs are placing their bets appeared first on IoT Analytics.